In today's modern office, fewer businesses are staffing their front desks with traditional, dedicated receptionists. In the age of technology, businesses are transforming their reception areas into smart offices. In these smart offices, front desks are being equipped with visitor management systems -- otherwise known as sign-in apps for iPad or Android tablets. What Is A Sign-In App? Front desk sign-in apps are electronic alternatives to traditional sign-in sheets and paper visitor logbooks. These visitor registration apps gather and record information every time a visitor enters your building. Not only do they automate, they do many tasks a Mad Men era receptionist could never accomplish. When using a sign-in app, visitors simply check in using an iPad receptionist or other tablet located in the office lobby instead of using a paper sign-in sheet. Visitor photos, badges, NDA eSignatures and more are obtained, logged and analyzed within the app itself. Why Use A Sign-In App? Traditional receptionists can cost more than $38,000 each year. Many businesses can't afford to pay reception staff. Or, even if they can, they realize there is a better use of their personnel and overhead costs. The reception area remains the most important workplace security point of a business. It is also where first impressions of your business are made. Leaving the reception area completely unattended is just not a smart option. 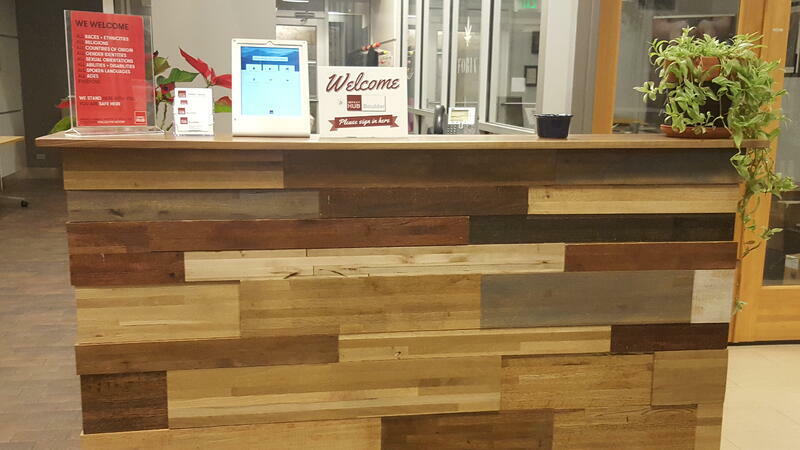 Front desk sign-in apps can perform reception tasks quickly, accurately and efficiently at a fraction of the cost of traditional receptionists. This frees your staff to direct their attention and efforts to more areas of business, increasing your productivity. What Features Should I Look For In A Sign-In App? Before automating visitor registrations, look for a check-in app that has the following features and more. Be easy to setup - Look for a sign-in app that can be setup in ten minutes or less. Have a great UI - An app with an easy to use and understand interface will help to enhance the visitor experience and ensure that your business makes a great first impression with first-time visitors. Be easy to customize / Support white-labeling - Your business is unique, and your sign-in app should reflect that. Sign-in apps that allow you to customize them with your logo and branding will leave a memorable impact on your visitors and set you apart from your competition. Flexible check-in - Supports a variety of check-in scenarios such as events, package deliveries, and food deliveries. Integrates with LDAP/directory services - Totally automate the admin process. The best check-in app access your directory of employees with your existing LDAP like Active Directory and Azure AD. Event registration - Host events at your workplace? Your visitor management system should be able to handle those too. Whether you are looking to add guests to your CRM or just know who is onsite. Inadequate security can leave your business vulnerable to violence, terrorism, and industrial espionage. Additionally, as many businesses undergo digital transformations, they become vulnerable to security issues such as data breaches. Small businesses account for 71% of data breaches. Purchasing an app with the following features can enhance your office's security and protect your employees, inventory and intellectual property. Visitor badges - Visitor badges include the visitor's name, photo, destination and the time and date they visited your business. This lets you quickly identify the visitor and determine that they are an authorized visitor. Visitor photos - Capturing a photo of each visitor allows you to quickly and accurately identify each visitor. Visitor logbook - Keeps a record of your visitors. Usually cloud-based so this information can be accessed and reviewed for any device. GDRP compliance - General Data Protection Regulation (GDRP) compliance ensures that your visitors' information is protected from exploitation and misuse, while protecting your business from suffering expensive fines, costly interruptions and embarassment. eSignatures for legal documents - Collects an electronic signature for documents like non-disclosure agreements. This also ensures that every visitor signs required forms before gaining entry. There are a lot of sign-in apps to choose from on the market today, however, pricing can fluctuate largely. The best apps will be efficient and cost-effective. Free trial - A free trial allows you to test out the software before you buy it. This will help you to be sure that the app you purchase is right for your business. Unlimited usage - Look for an app that offers unlimited usage and has no hidden fees. Smart offices are rapidly adopting visitor sign-in apps. This software automates visitor registration and is very affordable in comparison to traditional visitor management solutions. It is important to select the right product for your office. The best visitor sign-in apps will impress visitors, be easy to setup and check-in with, send your choice of instant reception notifications and offer lots of customization to fit your brand and reception needs. Also look for an app that provides extra layers of data and workplace security. Despite the abundance of features, your visitor sign-in software should cost just a few dollars a day with no surprises or hidden costs.